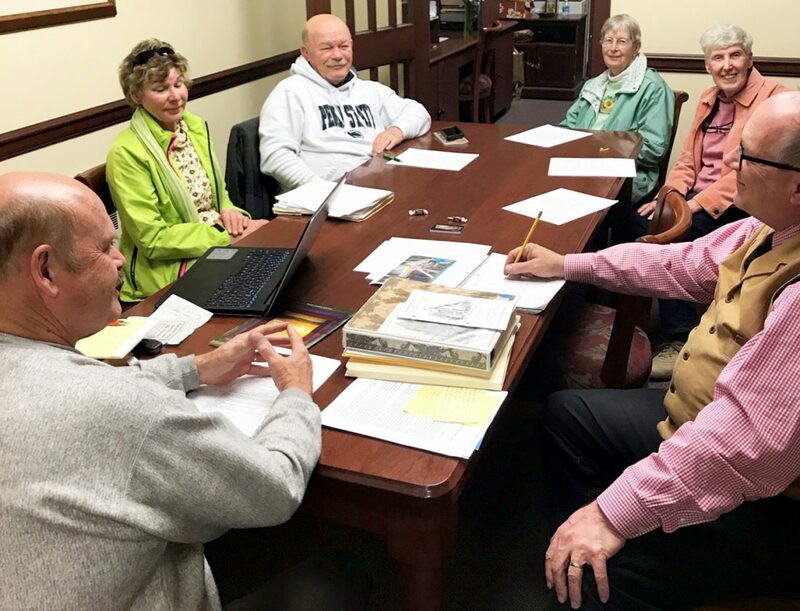 PHOTO PROVIDED Members of Great Island Presbyterian Church held a meeting to plan the Ecumenical Good Friday Service. Clockwise, from left, Kim Feerrar, music director; Joyce Gummo, elder; Steve Rhinehart, elder; Pat Helbley, organist; Nancy Merinar, elder; Pastor Taylor Camerer. Those who also helped but are not pictured are Christina Frank, chairperson and Whitney Merinar, elder. LOCK HAVEN — The Worship and Music Committee of Great Island Presbyterian Church, 12 W. Water St., wishes to announce an ecumenical Good Friday Service to be held Friday, April 19 at 7:30 p.m. Ample parking is available in the church lot adjacent to Mill Street. “The committee agreed that, somehow, Good Friday seems to be getting lost in all of our preparations for Easter Sunday. The day that our Lord died for us, should not be forgotten,” said Christina Frank, chairperson. Great Island’s choir, directed by Kim Feerrar, will be joined by voices from Bald Eagle Presbyterian Church, Jersey Shore Presbyterian Church, and Saint Paul’s Episcopal Church for the anthem. Kim directs both the Great Island Presbyterian and the St. Paul’s choirs. “We anticipate that this will be a meaningful fellowship between the church choirs. Perhaps it will be expanded to include all area singers in the future,” said Mrs. Frank. A traditional Tenebrae service is planned. A Tenebrae service is characterized by the gradual extinguishing of lights or candles as scripture is read, music is played, and the event of the day is memorialized. It is a contemplation event meant to recreate the betrayal, abandonment and agony of Jesus’ death. A collection to benefit One Great Hour of Sharing will be taken. This fund provides relief to those affected by natural disasters, provides food to the hungry and helps to empower the poor and oppressed. All are invited to share in this non-denominational service.